Peter Dinklage and PETA are trying to get Game of Thrones fans to stop buying Huskies because they resemble Direwolves from the hit HBO show. Dinklage and PETA have a fear that the dogs will be ignored and mistreated after the novelty of having the dogs wears off. Peter Dinklage is a long time humanitarian and animal lover who has teamed up with PETA for a second time to address the Husky situation that began when the show premiered in 2011. Since 2011, animal shelters have seen a surge in the abandonment of Huskies. The breed, which bears a striking resemblance to the Stark clan's Direwolves are often sought out by Game of Thrones fans. Peter Dinklage and PETA released a statement on PETA's website to address the situation. Dinklage had this to say. "Please, to all of Game of Thrones many wonderful fans, we understand that due to the Direwolves' huge popularity, many folks are going out and buying Huskies." Dinklage went on to talk about how buying the Huskies hurts the breed and the importance of getting dogs from a rescue shelter as opposed to buying them on a whim. The actor explains. "Not only does this hurt all the deserving homeless dogs waiting for a chance at a good home in shelters, but shelters are also reporting that many of these huskies are being abandoned, as often happens when dogs are bought on impulse, without understanding their needs. 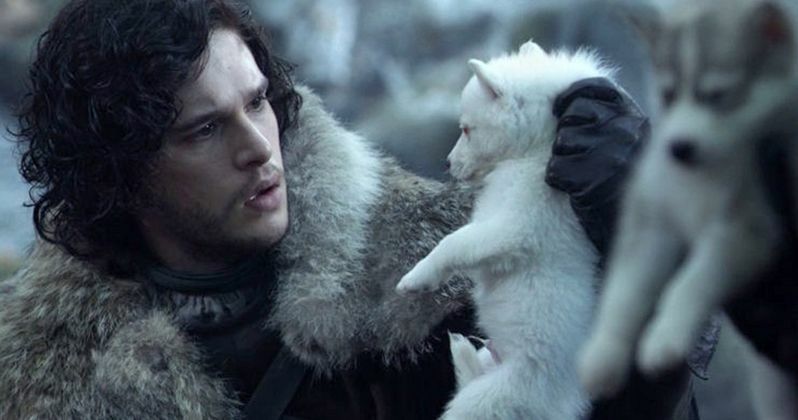 Please, please, if you're going to bring a dog into your family, make sure that you're prepared for such a tremendous responsibility and remember to always, ALWAYS, adopt from a shelter,"
Direwolves are fictional animals in Game of Thrones who are a large part of the mythology of the popular show. The large and intelligent Direwolves are closely linked to the Stark clan, but mainly Jon Snow and Arya Stark since theirs are the only two left alive at this point in the series. PETA has seen this happen on numerous occasions, most notably with the many releases of Disney's 101 Dalmatians. Dalmatians, much like other breeds of dogs often have issues that are specific to their breed with deafness, allergies, and urinary stones. Some owners took the dogs to shelters after the novelty wore off and realized that taking care of a dog was a great responsibility. Similar spikes happened with Beverly Hills Chihuahua as well as Men In Black and Legally Blonde. Peter Dinklage and PETA are making a good point and that point should be made for all dogs. It's unfortunate that Game of Thrones, a show that brings so much joy (and sorrow) is causing a problem for Huskies and animal shelters. At the same time, it's great to see Dinklage speaking out and using his fame to address the situation. Hopefully his words will be heard and people that were on the fence about buying a dog take a second to realize what they are getting themselves into.